A family tree that grows and moves with you! Family Tree - It's over 5 feet tall! In an attempt to "warm-up" one of the walls, I had remembered seeing removable, peel-n-stick "wall art" back in the states. I came across the the Roomates Tree Branch Wall Sticker and new I had a perfect place for it. Waiting impatiently for my wall stickers I had a "Whoa! What if I do this!" 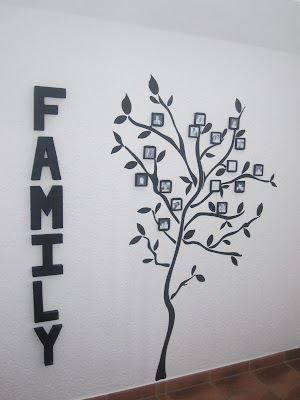 moment ... turn the wall sticker into a family tree! Not sure what to expect I waited until it arrived and put up a few test branches to see what options I had. After literally weeks of trying to find the right mini-frames (and trying to be cost-conscience) I stumbled across the Puzzle Photo Frame ... not quite sure if it would work, I ordered it anyway ... 8-frames for $7.49 (I ordered 3 for a total of 24 mini-frames)! I waited 3-weeks for for this shipment ... all the while staring at the "test-branches" on my wall and overlooking my husband's "what the heck is that" look. I'd say, "trust me, it's going to be AWESOME"! So ... I finally received the frames, tore the large frame apart to get to the "mini-frames" ... and perfect! Tree Branch Wall Sticker: The wall sticker does not come "assembled", the branches, leaves, little twigs, etc are all separate stickers. After trial and error I decided to place the tree branches the way they were on the package. They really do hold up well to removing and "re-sticking" ... we have highly textured walls and though they do not recommend textured walls for this product ... they work great! The leaves were the last touch ... after the photo frames! Frames: These frames are about 3x3 and weigh next to nothing. For ease of positioning and to avoid excess nail holes I used thumb-tack putty to stick the frames to the walls! Pictures: The most time consuming part of this project was finding pictures of each family member ... in fact if you look close you'll see a few "blank" frames. After finding the right pictures, I edited them to black and white, brightened the photos and cropped them down to approx. 2.5 x 2.5 inch squares. Letters: Just added! During our recent trip back to the U.S. I spent a considerable amount of time "stocking up" on craft supplies ... the letters being one of them. I bought these paper mache letters for 50% off, spray painted them black and used thumb-tack putty to adhere them to the walls. I would have preferred slightly smaller letters for this project ... but I used what I could get my hands on! Photo Placement: After a lot of deliberation (of which I will spare you) .... the right side of the tree is "my side of the family", the left side is "my husband's side" and the center branch is "us". Each sibling and their family has their own branch. The tree progresses from the "bottom up" ... grandparents at the bottom, followed by parents and then siblings in birth-order. From there the tree grows "out". The sibling towards the base of the branch and their children in birth-order growing "out" from the branch base. Supplies: If you want to create your own family tree with the supplies I used, save yourself hours of internet shopping! Here are the sites you can order your supplies. The thumb-tack putty can be found in just about any store. My Thoughts: No doubt, next time we move I may display our family tree a little different, change around the placement, maybe play with colored photos. What I really like about this project is that it is versatile and easily changed! You can literally do whatever you want with this tree to make it your own. If you like this project ... share it, blog about it, link to it, comment or just grab my button! I'd love for you to share your Family Tree project with us! Great idea! Shows how important family and heritage are! Found you through Tatertots & Jello. Love this idea!!!! What a cute idea! I love that tree and love that you can change it too! Thanks for linking it up!!! I absolutely love this! Thank you for saving me time, aggravation and possibly money by sharing the links for the supplies! I'm thinking this would make a wonderful Anniversary gift for my parent's! I Love, love, love this idea. Thanks so much for sharing! I love this idea! The whole wall looks great. that is seriously the cutest thing I've seen all day! Love it! very cool. Turned out great. Thanks for sharing your idea! You've been featured! Feel free to come grab my featured button! 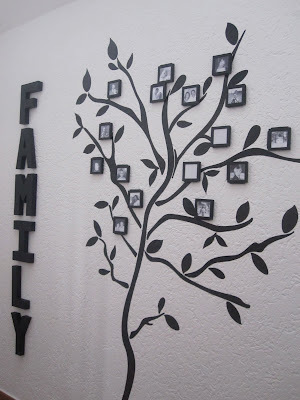 Oh wow - I just moved into my own apartment and was entertaining the idea of making a family tree on the wall with pics of family, but had NO CLUE how I was going to go about it - I LOVE YOURS and am stealing it :) You are awesome! Wow - this is so special and I'm thankful that you shared it. Happy Valentine's day! What a neat and clever idea! I think I'd have a panic attack trying to do one of those for my family (where most everyone on my mom's side of the family has divorced and remarried and divorced again! UGH! My husband's side would be quite simple... LOVE this love this though, it's a beautiful piece of wall art! Wow! I LOVE this and I am going to find a wall to do this on. 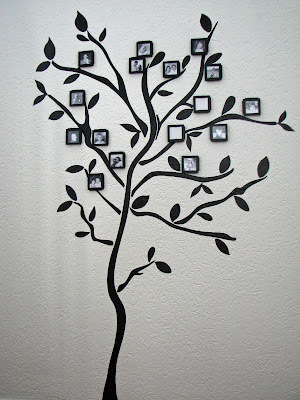 I have been wanting to do some sort of family tree and this looks perfect! tfs! What a wonderful idea. I thought about wall stickers to dress up my daughters room but this is much more purposeful than any I've seen. A beautiful way to decorate a wall and at the same time teach your kids about their history. I might have to suggest this for a client's kids room I'm working on now. Thanks for the inspiration! I just came across your family tree. I'm really into genealogy and this is great! I'd love to have the wall space to do something like this. By the way, your web site is cute! I have had an idea to do a photo family tree for some time now and have had difficulty coming up with a vision for it... and when I saw yours, I was instantly inspired!!! It seems the link to your picture frames isn't active anymore... so I guess I'll be doing some shopping... but it's so great to find something so creative and so inexpensive! Thanks for sharing! I love this idea! I already have the tree, but can't find similar frames. We're a military family posted in the middle of Australia so not much available here. I've tried looking on-line but no success. Any suggestions? They come in in packs and range from $5 - $6 per pack. So the average about $1.00 each! and the keeper of the blog! interesting to come back to! right to the blog post! added to my "to do" list!